No, wait. This is saying it lightly. My son is OBSESSED with Halloween. When he was four years old, he insisted on and even planned his own Halloween birthday party IN JULY. Yes, my son loves Halloween. Due to his extreme excitement, his sensory processing needs, and his anxiety, this is a cocktail for a month of meltdowns and the need for lots of wine for this mama. Halloween can be incredibly hard for some children, even the ones that love it the most. 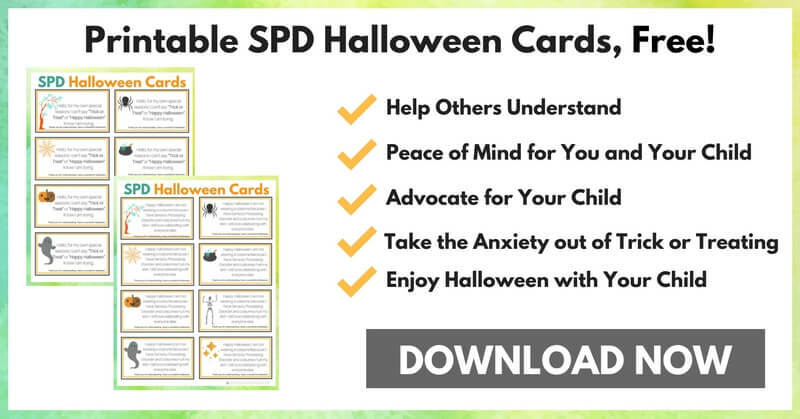 This year, in preparation, I’ve decided to make these printable SPD Halloween cards for children that struggle with costumes and greetings. 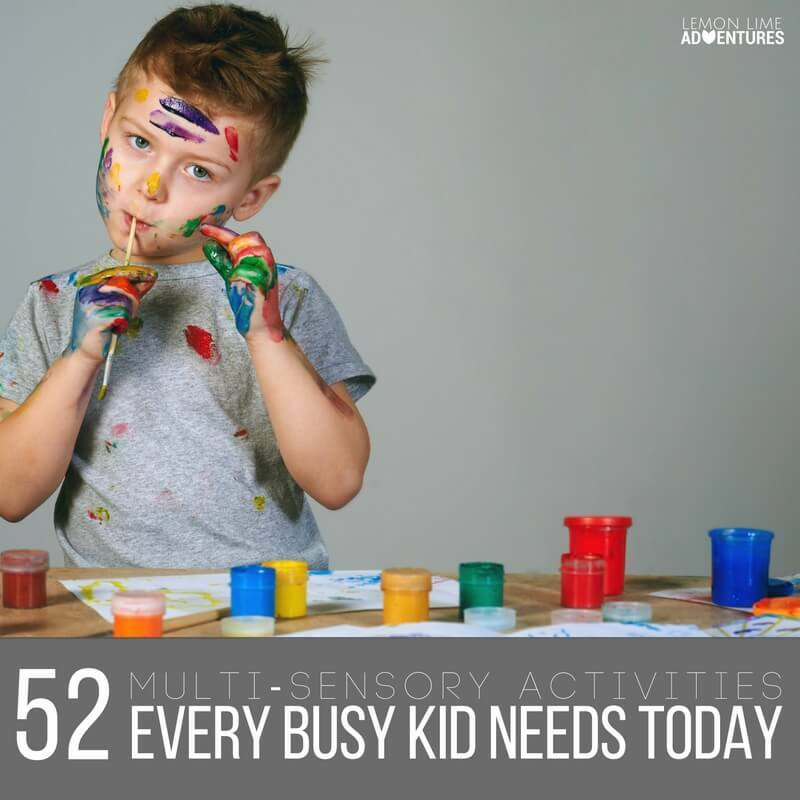 While I know these are not for every child, it can make or break the evening for children with neurological differences. 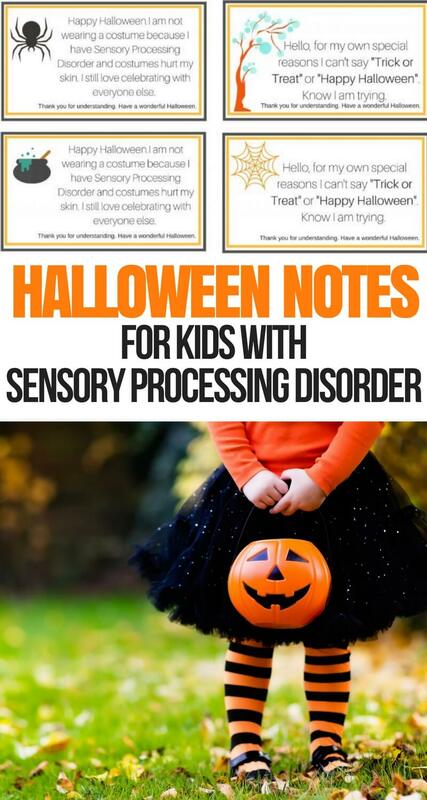 Whether your child has sensory processing disorder, ADHD, Autism or another sensitivity that makes Halloween difficult, you want your child to be successful. As parents, it can be hard to get the eye roll, or the stink eye when your child can’t or won’t speak but just puts their bag out for candy. In addition, it can be really hard to explain to others when your child refuses to wear a costume but still wants to join the festivities. If you are a friendly neighbor, grandparent, or friend, this behavior can be extremely confusing. 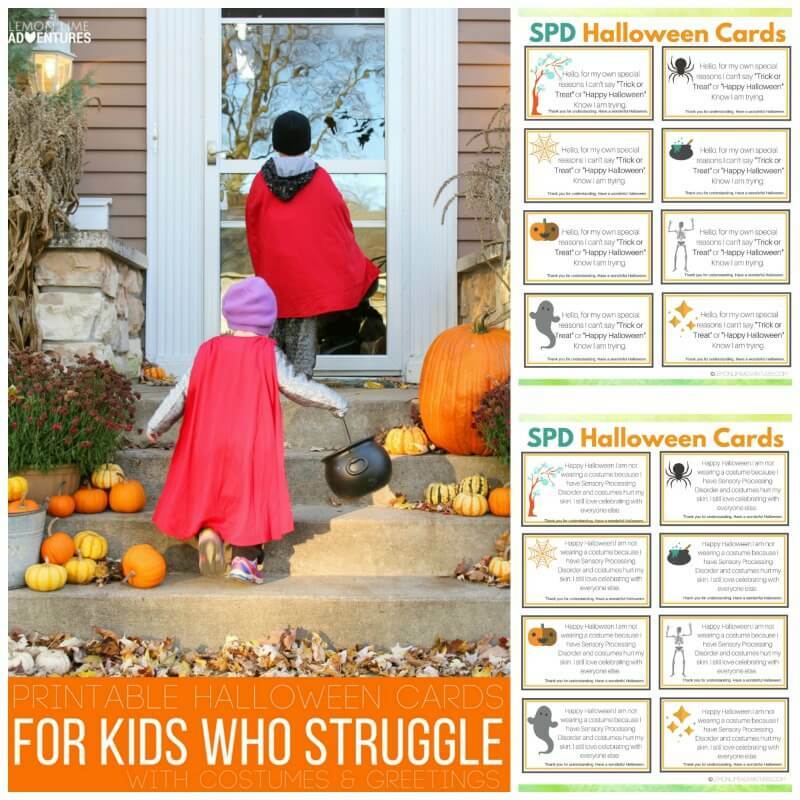 In this post, I plan to share common “misbehaviors” during Halloween, what you can do to make Halloween easier for those kids, and a free printable card to cut the explaining down to a minimum. As I have mentioned before, Halloween can be an exciting but overwhelming holiday for many children. 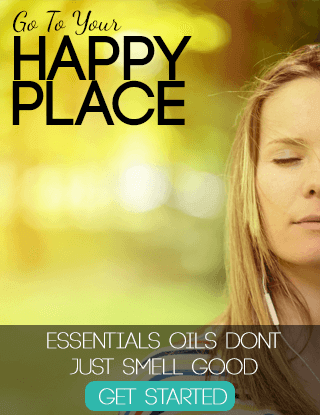 Every one of their senses are challenged and their anxiety is tested to full capacity. Things that are not real seem so real on this day, and their brains are forced to process a lot of information at one time, causing children to shut down or worse go into a complete sensory meltdown. For many of us, we want to see these as misbehaviors and bad parenting. I want to assure you that it is not those things. 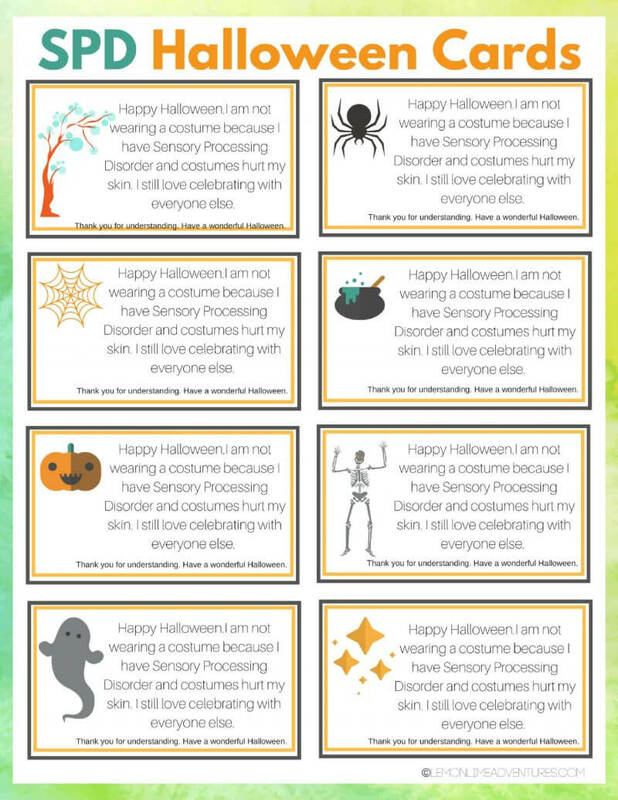 Even for children that are neurotypical, Halloween can be extremely overwhelming to the senses and can overwhelm the brain, making it hard to make “appropriate” and “acceptable” choices. These cards are designed to share a little information (without sharing too much) with the people in your neighborhood to better understand your child. The hope is they can look past the behaviors and help you give your child the best Halloween you can. These cards are super easy to use and print. I have made them without any “diagnosis” on the printable because I know there are many children that struggle on this exciting day of the year. Since I also know that the struggles can vary depending on the child, I have created two pages with two different statements. If you need a different statement, don’t hesitate to let me know so I can make you the version perfect for your family. One final accommodation I included was the use of different kinds of Halloween images, from spooky to completely non-spooky. This way you can find the perfect version for your child. While these can be extremely helpful to making your Halloween smoother, this isn’t all you need. 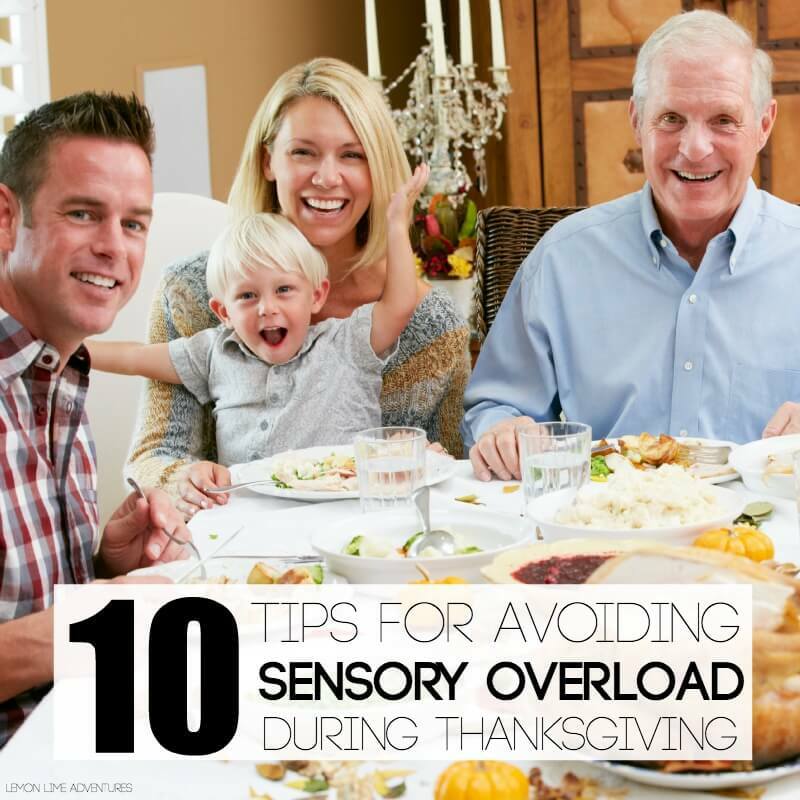 I have decided to share my top ten tips for surviving and thriving during Halloween with a child with sensory needs, anxiety, ADHD, Autism or all of the above. Practice Run | Test the costume, test going to a neighbors house, test walking down the block. Test all of it. 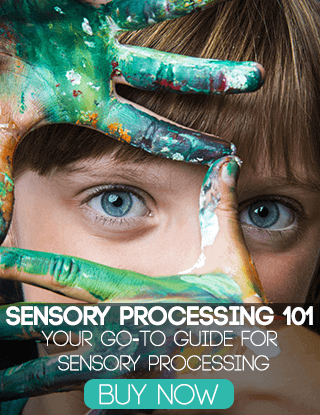 You want to give your child enough time to process and make sense of everything they will be doing on the big day. Alternative Costumes | Be prepared with different shoes, a different mask, different gloves, etc. A child can get overly overwhelmed by the tactile input of many Halloween costumes. 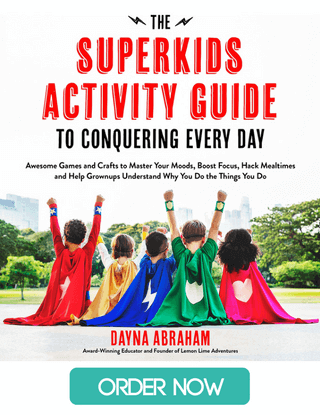 Make a Plan |Many children do so much better when they feel a sense of control. During Halloween, everything can feel out of control for your child. Give them a clear plan (and even a schedule) of what is going to happen on the big day. 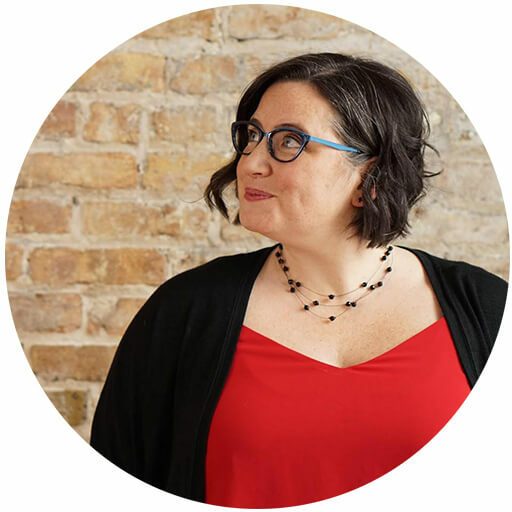 Lower Expectations | This is one of my biggest tips for all holidays. Even though you might have done Halloween last year, or your child is getting older, don’t assume that the evening will go perfectly. When you are in the mindset and prepared for only a few houses or a few minutes of trick or treating, you will be more successful when your child is ready to be done. Exit Strategy | Have a plan in place or a retreat ready for when your child gets overwhelmed and can’t go anymore or handle any more stimuli. Buddy Up | Having a buddy system can be great for children that might otherwise be nervous to approach new homes and new faces. 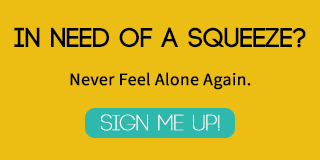 Having a friend walk with them can be just what they need to feel comfortable. Be Flexible | I know you spent hours on the perfect costume. Be prepared to let your child go with absolutely no costume if it is bothering them on the big day. Teal Pumpkins | Look for houses that are displaying a teal pumpkin or sign that they have non-candy treats. Non-candy treats can be perfect for children that have a food sensitivity or get overwhelmed by sugar and new flavors. Safety Precautions | Children with sensory needs can be prone to running into a street, jumping over bushes or pushing children. Be prepared for what you are going to do when this happens, practice a safe body and personal space before you head out for the night, but be prepared to give lots of reminders. Have Fun | Most of all, have fun. Take your deep breathes. Keep everyone safe and when you get home, collapse on the floor and make yourself a nice Halloween cocktail. You deserve it when you survive Halloween! 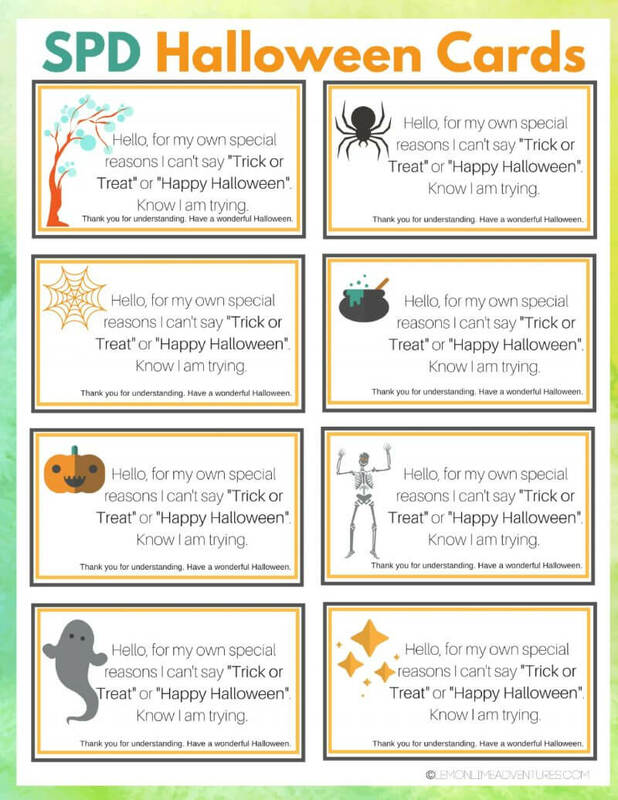 This post comes with a free printable to share with friends, take to parties, or to pass out as you trick or treat. Get yours today!